See I promised I would be back soon. 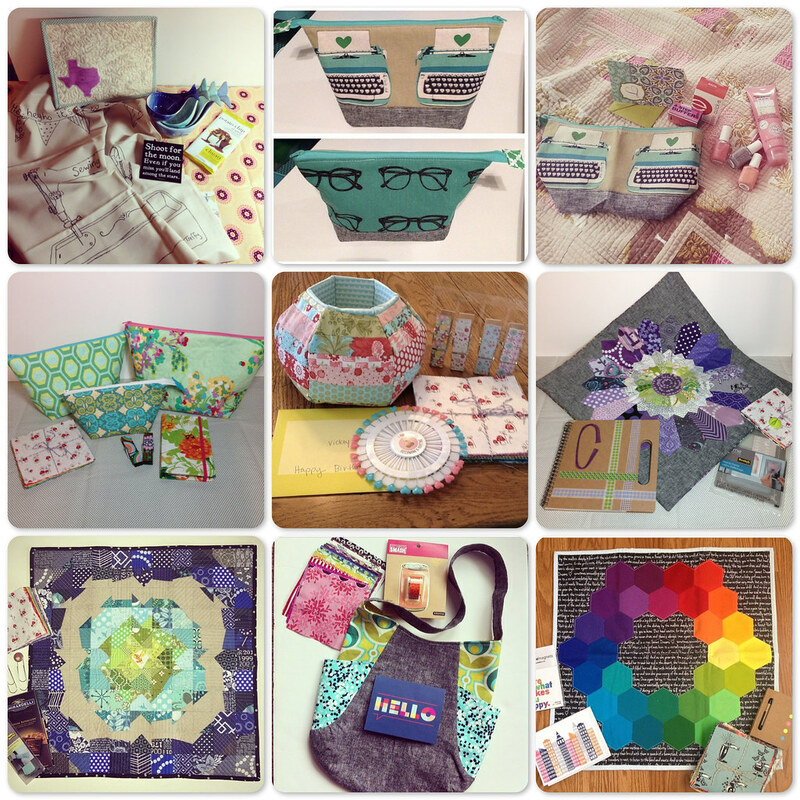 Instagram has become a thriving quilting community that has spawned everything from fabric garage sales to swaps. Everything is organized using hashtags and there are thousands to tens of thousands of quilters posting and tagging pictures. I have become involved with two separate birthday swaps. The idea being that each month someone or several someones have a birthday and receive gifts in the mail from all the other swap members. So when your birthday rolls around you receive 11 gifts for your birthday from the other swap members. One swap is handmade gifts and other small goodies. The members give ideas of their fabric styles and what they would love to receive in the mail. Then the members make gifts for the birthday girl and mail them out. In the picture below the bottom two rows of pictures are what have been made by me for the birthday girls. There have been pouches, an epic pincushion, purses and lots of pillow covers and mini quilts. The other swap is a shopaholics group. This group is more organized that there is only one birthday each month and they have a pinterest board of gift items that they want to receive. Then the members go shopping and have the option to make small gifts if they have time and the patience. The problem is that I usually want to keep everything or buy multiples and keep a set. I have been pretty good about this so far but Anthropolgie's home decor is testing my will. The top row of pictures are gifts that have been sent for this swap. I am looking forward to my birthday with many more reasons now!